Making clam chowder at home has always seemed like a tall task to me. Somehow you have to get clams, cook and chop them, and then make a smooth creamy base. Getting the seasoning right, adding the right vegetables…I always figured I would need to get clam chowder at a restaurant to really enjoy it. I got this recipe from a cookbook, “Recipes from Historic New England,” by Linda & Steve Bauer, which I got as a 30th birthday gift from my good friends Mike & Anne who know about my fondness both of New England and of cooking. The cookbook is really cool – all the recipes come from famous New England restaurants and historic bed and breakfasts. 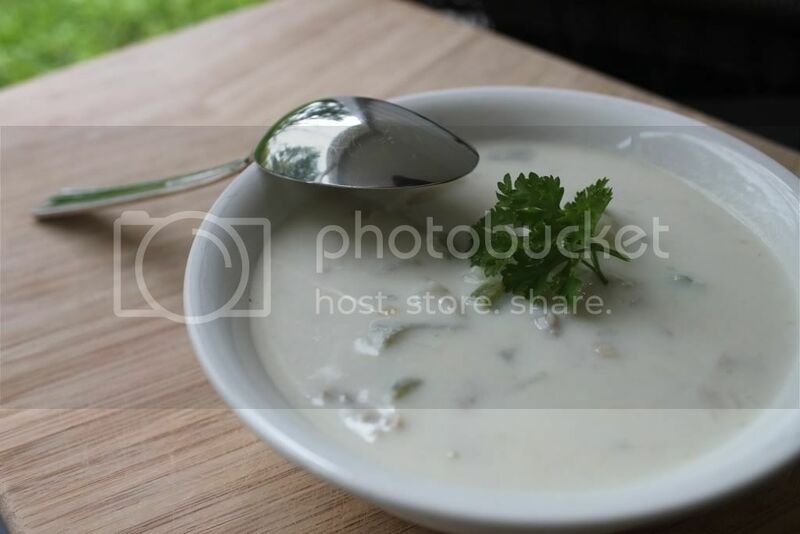 There are some really awesome looking dishes in there – but I chose to try a clam chowder recipe from the Chatham Bars Inn section. As it uses canned clams and clam juice it was super easy. Both of these ingredients previously had kinda creeped me out…something about canned mollusks just didn’t seem right to me…but, I figured if it’s good enough for the Chatham Bars Inn, it would be good enough for me. It also introduced me to another new ingredient, salt pork – this is kind of like bacon, only fattier and saltier. I would highly suggest you not try to eat it as a side dish with your morning eggs, but it really lends a tasty smokiness to the Clam Chowder – which I think is what all my previous attempts at Clam Chowder lacked. I also omitted the ‘clam boullion cubes’ this recipe called for – because who has clam boullion cubes in their pantry, really – but it came out perfectly clammy despite this omission. I served it with some delicious buttery biscuits, and it was fantastic. In a dutch oven, or a deep heavy saucepan, melt the butter over medium heat. Saute the onion and celery for about 5-10 minutes, or until the vegetables are translucent. Stir in the flour, cooking for about 5 minutes. Drain the clams, reserving the juice. Add the reserved and the bottled clam juice to the saucepan, whisking until smooth. Add the sliced salt pork and the chopped clams to the soup, and cook for about 20 minutes over low-medium heat. After 20 minutes of cooking time, add the cooked potato. Turn off heat and let the mixture stand covered for 20 minutes. Remove the salt pork from the chowder. Stir in the warmed half-and-half to the chowder. Season with salt and pepper to taste. Enjoy!